"Texas Supreme Court Rules School Funding System is Constitutional" was first published by The Texas Tribune, a nonprofit, nonpartisan media organization that informs Texans — and engages with them — about public policy, politics, government and statewide issues. The Texas Supreme Court on Friday issued a ruling upholding the state’s public school funding system as constitutional, while also urging state lawmakers to implement "transformational, top-to-bottom reforms that amount to more than Band-Aid on top of Band-Aid." But without a court order directing the Legislature to fix specific provisions in the system, school groups worry that lawmakers will either do nothing or something outside the box. There were no dissenting opinions; Justices Eva Guzman and Jeff Boyd delivered concurring ones. "Good enough now ... does not mean that the system is good or that it will continue to be enough," Guzman wrote. "Shortfalls in both resources and performance persist in innumerable respects, and a perilously large number of students is in danger of falling further behind." Friday’s ruling is the second time the state’s highest civil court has upheld the state’s school finance system. Since the 1980s, school districts have repeatedly sued the state in an attempt to increase public education funding, and have often prevailed. The latest case, brought by more than two-thirds of Texas school districts, is the seventh time such a case has reached the state Supreme Court. “This is an historic ruling by the Texas Supreme Court, and a major victory for the people of Texas, who have faced an endless parade of lawsuits following any attempt to finance schools in the state,” Attorney General Ken Paxton said in a statement Friday. "We have said all along that school financing must be debated and shaped by the Texas Legislature, not through decades’ worth of ongoing litigation in the court system, and I’m pleased the court unanimously agrees." A recent study by the National Education Association found that Texas ranks 38th in the country in per-pupil public-education spending. “I think they’re going to have to do something, but will it be enough? I doubt it,” said Pierce, asked about whether he thinks lawmakers will increase funding. But some Democratic and Republican state lawmakers on Friday called for action on the issue. "While I applaud and agree with the Texas Supreme Court’s ruling, make no mistake: This is not the end of this journey, but the beginning,” said state Rep. Jeff Leach, R-Plano. "The duly elected Texas Legislature – not the courts – has the immense responsibility to work to reform, improve and strengthen education in Texas." "For far too long, the state has been neglecting its responsibilities, failing to pick up its fair share of the school finance tab, and pushing the costs down to overburdened local taxpayers,” said state Rep. Donna Howard, D-Austin. More than 600 Texas school districts sued the state after the Legislature cut $5.4 billion from the public education budget in 2011. Their lawyers argued the state's method of funding public schools was unconstitutional on a variety of grounds — that the Legislature had failed to provide districts with sufficient funding to ensure students meet the state's increasingly difficult academic standards; that big disparities had emerged between property-wealthy and property-poor school districts; and that many school districts were having to tax at the maximum rate just to provide a basic education, meaning they lacked "meaningful discretion" to set rates. That amounts to a violation of a constitutional ban on a statewide property tax. In a 2014 ruling, Travis County District Court Judge John Dietz — a Democrat — upheld all of those claims, siding with the plaintiff school districts. He also ruled against two other parties in the lawsuit that did not represent traditional school districts, directing them to seek relief from the state Legislature. After a trial that lasted more than three months, Travis County District Court Judge John Dietz ruled in February 2014 that the state's school finance system is unconstitutional. In early 2012, a group representing parents, school choice advocates and the business community — Texans for Real Efficiency and Equity in Education — filed a suit alleging that the current school finance system is inefficient and over-regulated. The Texas Charter Schools Association also sued the state, arguing that a cap on charter school contracts and charters' lack of access to facilities funding was unconstitutional. In Friday's ruling, the state Supreme Court upheld Dietz’s ruling relating to the fairness coalition and charter schools association but struck down the rest, meaning that all plaintiffs essentially lost out on any injunctive relief. But Robert Henneke, general counsel for the Texas Public Policy Foundation, a conservative think tank that backed the so-called efficiency intervenors, painted an optimistic picture of the ruling. During oral arguments Sept. 1, state lawyers asked the court to dismiss or remand the case to a lower court so it may consider changes lawmakers recently have enacted to the state's school finance system. Last year, the Legislature increased public education funding by $1.5 billion — snubbing a $3 billion House proposal — and authorized another $118 million for a high-quality pre-kindergarten grant program that Gov. Greg Abbott championed. Before issuing his ruling, Dietz reopened evidence for a four-week period so that he could consider changes made by the 2013 Legislature, which restored about $3.4 billion of the $5.4 billion in public education cuts made in 2011 and changed graduation and testing requirements. Abbott, who was serving as attorney general at the time, appealed Dietz's ruling directly to the all-Republican state Supreme Court. On Friday, Abbott called the ruling "a victory for Texas taxpayers and the Texas Constitution." He added that the decision "ends years of wasteful litigation by correctly recognizing that courts do not have the authority to micromanage the State's school finance system." And teacher groups bemoaned the decision. “It is a sad day when the state’s highest court decides that doing the least the state can do to educate our children is enough,” said Texas State Teachers Association President Noel Candelaria. Sheryl Pace, a school finance expert at the business-backed Texas Taxpayers and Research Association, said the court decision surprised her given the sheer number of school districts suing. She stressed that the decision does not preclude state lawmakers from making changes to the school finance system, which the court described as deeply flawed. Whether state lawmakers will actually do so is another question, though, she said. Last year, an effort to overhaul the school finance system failed, with opponents arguing the Legislature should wait for the state Supreme Court ruling. Disclosure: The Texas State Teachers Association, the Texas Public Policy Foundation and the Center for Public Policy Priorities have been financial supporters of The Texas Tribune. A complete list of Tribune donors and sponsors can be viewed here. Correction: A previous version of this story incorrectly said Friday was the first time the Texas Supreme Court has upheld the state’s school finance system as constitutional. It was the second time. Texas Supreme Court Rules School Funding System is Constitutional By Kiah Collier May 13, 2016 *Editor's note: This story has been updated throughout. *Correction appended The Texas Supreme Court on Friday issued a ruling upholding the state’s public school funding system as constitutional, while also urging state lawmakers to implement "transformational, top-to-bottom reforms that amount to more than Band-Aid on top of Band-Aid." But without a court order directing the Legislature to fix specific provisions in the system, school groups worry that lawmakers will either do nothing or something outside the box. “Our Byzantine school funding ‘system’ is undeniably imperfect, with immense room for improvement. But it satisfies minimum constitutional requirements,” Justice Don Willett wrote in the court’s 100-page opinion, which asserts that the court’s “lenient standard of review in this policy-laden area counsels modesty.” There were no dissenting opinions; Justices Eva Guzman and Jeff Boyd delivered concurring ones. "Good enough now ... does not mean that the system is good or that it will continue to be enough," Guzman wrote. "Shortfalls in both resources and performance persist in innumerable respects, and a perilously large number of students is in danger of falling further behind." Coming TuesdayA Conversation With Texas Education Commissioner Mike Morath Friday’s ruling is the second time the state’s highest civil court has upheld the state’s school finance system. Since the 1980s, school districts have repeatedly sued the state in an attempt to increase public education funding, and have often prevailed. The latest case, brought by more than two-thirds of Texas school districts, is the seventh time such a case has reached the state Supreme Court. “This is an historic ruling by the Texas Supreme Court, and a major victory for the people of Texas, who have faced an endless parade of lawsuits following any attempt to finance schools in the state,” Attorney General Ken Paxton said in a statement Friday. "We have said all along that school financing must be debated and shaped by the Texas Legislature, not through decades’ worth of ongoing litigation in the court system, and I’m pleased the court unanimously agrees." Houston lawyer Mark Trachtenberg, who represented 88 property-wealthy school districts in the case, said the ruling "represents a dark day for Texas school children, especially given the Legislature’s repeated failure to adequately fund our schools.” A recent study by the National Education Association found that Texas ranks 38th in the country in per-pupil public-education spending. Wayne Pierce, executive director of the Equity Center, which represented more than 440 low- and medium-wealth school districts in the case, said the high court has “pretty well given a blank check to the Legislature and the only question now is if Legislature steps up and does the right thing or if they take this as an opportunity to further hurt the system.” “I think they’re going to have to do something, but will it be enough? I doubt it,” said Pierce, asked about whether he thinks lawmakers will increase funding. “Will this [court decision] be used to not fix public education but go out on some tangential rabbit trail? I think that’s probably more likely,” he said. “If this decision has a silver lining, it’s around a huge, black cloud.” But some Democratic and Republican state lawmakers on Friday called for action on the issue. "While I applaud and agree with the Texas Supreme Court’s ruling, make no mistake: This is not the end of this journey, but the beginning,” said state Rep. Jeff Leach, R-Plano. "The duly elected Texas Legislature – not the courts – has the immense responsibility to work to reform, improve and strengthen education in Texas." "For far too long, the state has been neglecting its responsibilities, failing to pick up its fair share of the school finance tab, and pushing the costs down to overburdened local taxpayers,” said state Rep. Donna Howard, D-Austin. More than 600 Texas school districts sued the state after the Legislature cut $5.4 billion from the public education budget in 2011. Their lawyers argued the state's method of funding public schools was unconstitutional on a variety of grounds — that the Legislature had failed to provide districts with sufficient funding to ensure students meet the state's increasingly difficult academic standards; that big disparities had emerged between property-wealthy and property-poor school districts; and that many school districts were having to tax at the maximum rate just to provide a basic education, meaning they lacked "meaningful discretion" to set rates. That amounts to a violation of a constitutional ban on a statewide property tax. 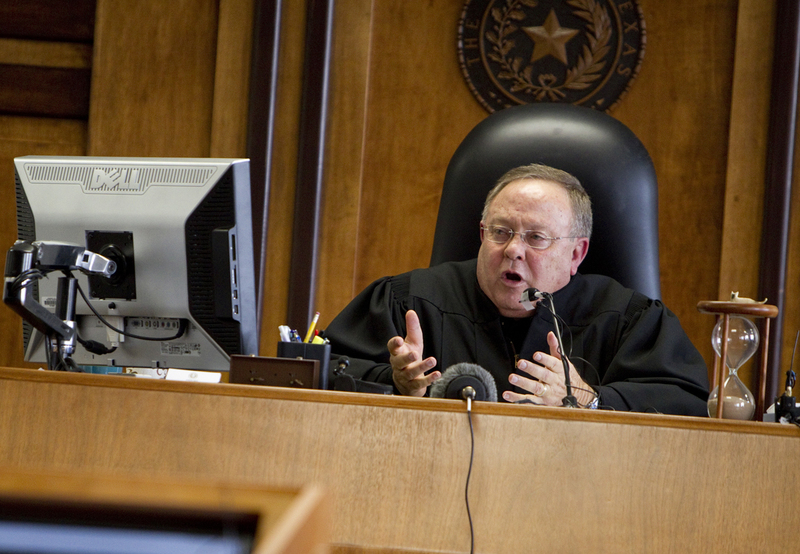 In a 2014 ruling, Travis County District Court Judge John Dietz — a Democrat — upheld all of those claims, siding with the plaintiff school districts.&nbsp; He also ruled against two other parties in the lawsuit that did not represent traditional school districts, directing them to seek relief from the state Legislature. Enlarge Photo by: Marjorie Kamys Cotera After a trial that lasted more than three months, Travis County District Court Judge John Dietz ruled in February 2014 that the state's school finance system is unconstitutional. In early 2012, a group representing parents, school choice advocates and the business community — Texans for Real Efficiency and Equity in Education — filed a suit alleging that the current school finance system is inefficient and over-regulated. The Texas Charter Schools Association also sued the state, arguing that a cap on charter school contracts and charters' lack of access to facilities funding was unconstitutional. In Friday's ruling, the state Supreme Court upheld Dietz’s ruling relating to the fairness coalition and charter schools association but struck down the rest, meaning that all plaintiffs essentially lost out on any injunctive relief. But Robert Henneke, general counsel for the Texas Public Policy Foundation, a conservative think tank that backed the so-called efficiency intervenors, painted an optimistic picture of the ruling. “The court thoroughly rejected the notion that the amount of funding into the system is what is constitutionally required,” he said. “While the court defers to the Legislature to make policy, I think the court’s opinion made clear that there is need for reform and, globally, much broader than mere funding and finance.” During oral arguments Sept. 1, state lawyers asked the court to dismiss or remand the case to a lower court so it may consider changes lawmakers recently have enacted to the state's school finance system. Last year, the Legislature increased public education funding by $1.5 billion — snubbing a $3 billion House proposal — and authorized another $118 million for a high-quality pre-kindergarten grant program that Gov. Greg Abbott championed. Before issuing his ruling, Dietz reopened evidence for a four-week period so that he could consider changes made by the 2013 Legislature, which restored about $3.4 billion of the $5.4 billion in public education cuts made in 2011 and changed graduation and testing requirements. “Our Byzantine school funding ‘system’ is undeniably imperfect, with immense room for improvement. But it satisfies minimum constitutional requirements.”— Texas Supreme Court Justice Don Willett, in the court's school finance opinion Abbott, who was serving as attorney general at the time, appealed Dietz's ruling directly to the all-Republican state Supreme Court. On Friday, Abbott called the ruling "a victory for Texas taxpayers and the Texas Constitution." He added that the decision "ends years of wasteful litigation by correctly recognizing that courts do not have the authority to micromanage the State's school finance system." Meanwhile, the Center for Public Policy Priorities, a left-leaning think tank, called on the Legislature to “make meaningful investments in our schools so that all Texans have the chance to live up to their full potential.” And teacher groups bemoaned the decision. “It is a sad day when the state’s highest court decides that doing the least the state can do to educate our children is enough,” said Texas State Teachers Association President Noel Candelaria. Sheryl Pace, a school finance expert at the business-backed Texas Taxpayers and Research Association, said the court decision surprised her given the sheer number of school districts suing. She stressed that the decision does not preclude state lawmakers from making changes to the school finance system, which the court described as deeply flawed. “I do think this frees up the Legislature so that they can address school finance if they want to,” she said. “There won’t be an injunctive deadline being held over their heads.” Whether state lawmakers will actually do so is another question, though, she said. Last year, an effort to overhaul the school finance system failed, with opponents arguing the Legislature should wait for the state Supreme Court ruling. Disclosure: The Texas State Teachers Association, the Texas Public Policy Foundation and the Center for Public Policy Priorities have been financial supporters of The Texas Tribune. A complete list of Tribune donors and sponsors can be viewed here. Correction: A previous version of this story incorrectly said Friday was the first time the Texas Supreme Court has upheld the state’s school finance system as constitutional. It was the second time. "Texas Supreme Court Rules School Funding System is Constitutional" was first published at by The Texas Tribune, a nonprofit, nonpartisan media organization that informs Texans — and engages with them — about public policy, politics, government and statewide issues. Link back to the original article, which is located at https://www.texastribune.org/2016/05/13/texas-supreme-court-issues-school-finance-ruling/.